Many football websites discuss deserving players left out of the Pro Football Hall of Fame. Al Wistert’s name often pops up in these conversations. Personally, I love the Hall and am not here to question their choices. I will, however, appreciate the career of a man named All-NFL for 8 seasons on both offense and defense. One might say Al was born to play for the Philadelphia Eagles. He was born on December 28, 1920, the exact same day as future teammate and Hall of Famer Steve Van Buren. Tragedy also coincidentally paired him with another future Hall of Fame teammate. Al’s father, a Chicago policeman, was shot and killed when Al was 6 years old. Pete Pihos’ father was also murdered while Pete was growing up. Al played his college ball at Michigan, but football wasn’t his reason for attending. In fact, although Al played baseball and basketball in high school, he hadn’t played organized football until his sophomore year in college. The classroom attracted Wistert to Ann Arbor as much as sports. “Academics were very important to me. Academics and athletics were tied right together,” he told The Game before the Money. Al and his brothers all played tackle for Michigan, and each made All-American. All wore number 11. The university retired the number in tribute, one of only a handful of numbers retired by the Wolverines. Still, Al had to work his pay his own tuition, and worked several jobs to pay for school. Imagine Jadeveon Clowney having to pay for college. How many of today’s NCAA stars would even be enrolled if they had to pay for their education and chance to play football? A broken wrist exempted Al from military service during World War II. The injury ironically allowed him to start his pro football career rather than go to war. The Eagles drafted him in the 5th round of the 1943 NFL Draft. 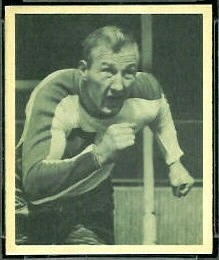 “Harry Thayer, the manager of the Eagles, signed me to play for the Eagles. What he didn’t tell me was that the Eagles and Steelers were combined that year. I didn’t know anything about that until I got to Philadelphia.” Al began his career with the “Steagles.” While many of the Steagles were unable to serve Uncle Sam on the battlefield, they did contribute to the war effort in factories during the day. The Eagles sustained their own operations without Pittsburgh’s help in 1944 and beyond. Wistert played tackle, anchoring both the offensive and defensive lines. Bucko Kilroy played beside him all of Al’s career. The Eagles arguably experienced the greatest success in franchise history in the years following World War II, appearing in three straight NFL Championships. Philadelphia dropped the 1947 title game to the Chicago Cardinals. Charley Trippi of the Cardinals remembered the wind chill factor being 20 degrees below zero. Trippi overcame the weather and scored two touchdowns for the Cardinals. The Eagles won their third straight conference crown in 1949, blanking the Rams 14-0 in the championship. The Eagles remain the only team in NFL history to record back-to-back shutouts in championship games. Al retired in 1951, at age 31. “Pro football’s a great game as long as you’re able to give more than you receive,” he told the Associated Press. Al felt he was getting more than he was giving as of late. He moved on to a career in the insurance industry. Al Wistert’s All-NFL play anchored an Eagle defense that still holds what may be an unbeatable record: two straight championship game shutouts. His blocking cleared the path for Steve Van Buren’s Hall of Fame runs. Teammates also often spoke of his outstanding special teams play. His number is not only retired at Michigan. His number 70 hangs with Van Buren’s and teammate Chuck Bednarik’s retired jerseys in Philadelphia. Al Wistert may not be the most famous man to step on a football field, but he’s truly an all-time great. NOTE: You can read Al’s story in The Game before the Money: Voices of the Men Who Built the NFL, available September 1, 2014 from the University of Nebraska Press. You can pre-order a copy from Amazon.com here.